And yes, the plain ones still cost $2. No, really. The “fan-first” pricing at Mercedes-Benz Stadium has been a common talking point at Georgia World Congress Center this week as NFL, Atlanta Super Bowl Host Committee, and Mercedes-Benz Stadium officials have hosted various press conferences. Yes, we’re still doing it. Yes, the hot dogs really do cost $2. 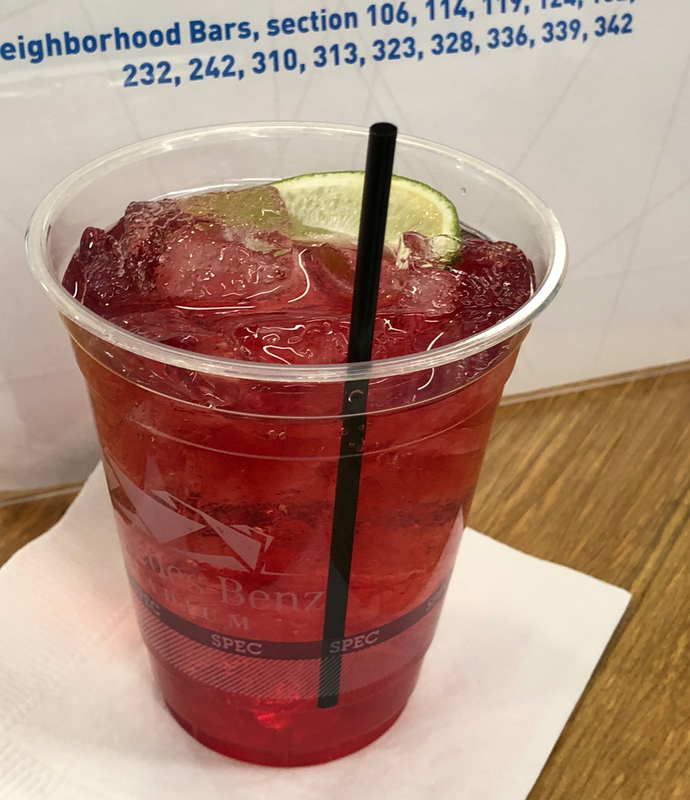 Atlantans are well-versed in Arthur Blank’s game-changing pricing structure of $3 fries and $4 refillable sodas, which will remain intact for the Super Bowl as promised. So let’s take a look at something that will be different for the Super Bowl: the team-themed hot dogs. 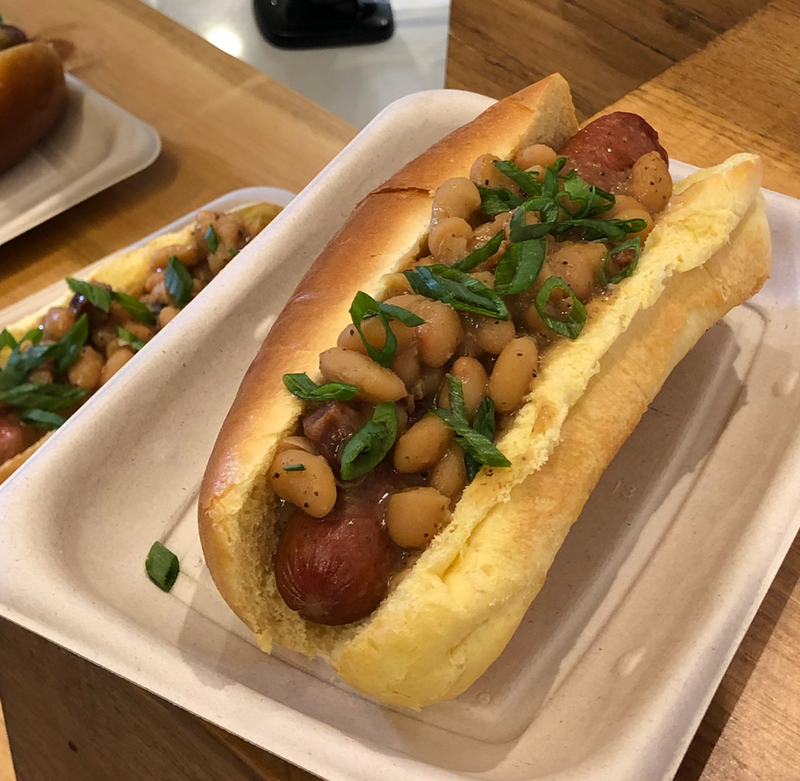 Mercedes-Benz Stadium will be selling one specialty hot dog for each team playing in the big game. The “L.A. 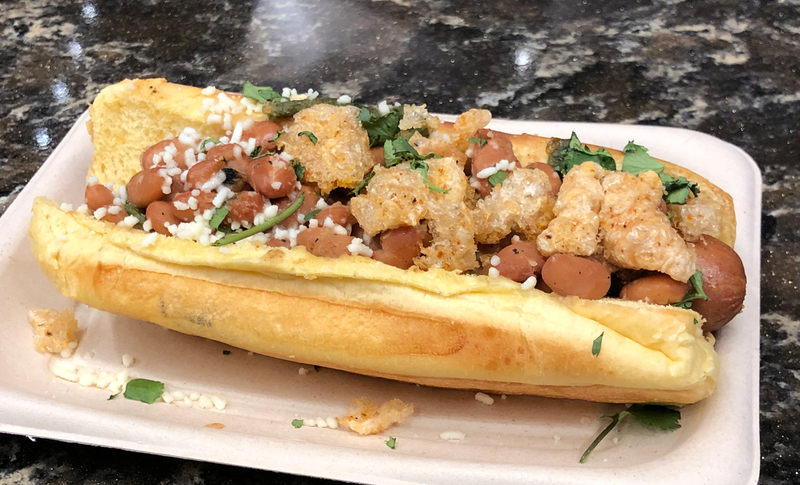 Chicharron Dog” for the Rams is topped with pinto beans, jalapenos, roasted poblanos, cotija, and of course, chicharrones. Meanwhile, Patriots fans can chow down on the “N.E. Beantown Frank,” which is topped with beans, maple syrup, and bacon. Both hot dogs cost $5 each (a bit more than the plain $2 variety) and can be found at the ATL Fan Fare stands. There will also be a specialty cocktail for each team. 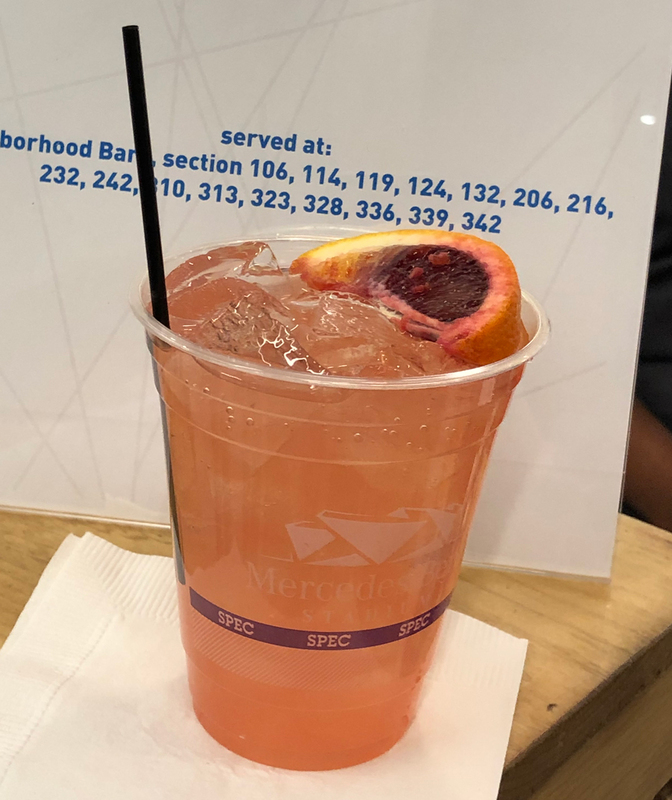 For the Rams, the “PaLomA” with tequila, rum, grapefruit, and soda, topped with a blood orange slice. For the Patriots, it’s “the New Englander” which is a vodka cranberry with soda water. Both drinks are $12 each and found at Neighborhood Bars. 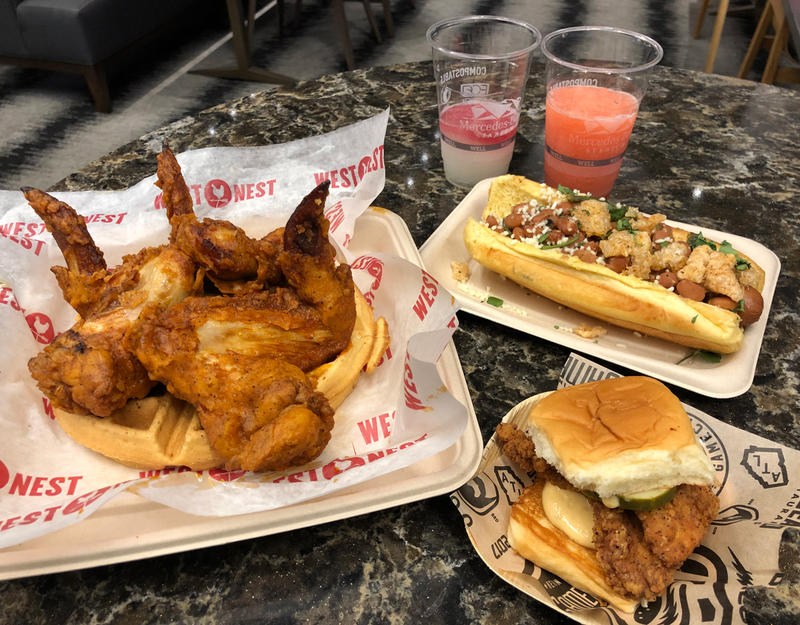 At a media preview on Tuesday, Mercedes-Benz also showed off a West Nest offering—a massive portion of chicken and waffles topped with sorghum butter and hot sauce. At $12, it’s a pricier item, but large enough that it could be easily split between two people. Chef Kevin Gillespie was also on-site to talk about his stall, Gamechanger, which won’t be doing anything new for the big game due to the fact that their Closed on Sunday chicken sandwich has already earned a reputation. “I want everyone who’s read about the Closed on Sunday sandwich to actually be able to try it,” Gillespie said, noting that in order to determine the proper amount of sandwiches the stand would need for the Super Bowl, they took the highest amount of sandwiches they’d ever sold at a game and multiplied it by 1.5. “I guess there’s still the chance we run out of them, but that’s a lot,” he said. Finally, when you go to the stadium, you might notice a Super Bowl sticker over the Coca-Cola logos on the soda machines, as we did during the media preview. The stadium sells Coca-Cola products in its fountains, but Pepsi—in case you haven’t seen the enormous ads all over downtown—is the official soda sponsor of Super Bowl LIII. As a solution to this tricky situation, according to 11 Alive, Coke products will still be served in the self-serve fountains, but bottled Pepsi products will be sold throughout the stadium. Pepsi will also be served in the NFL suites.